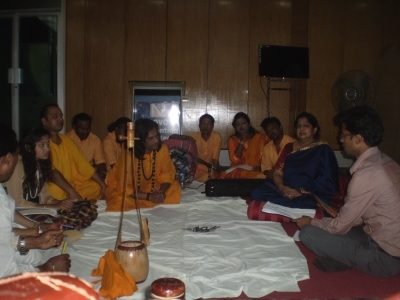 Pally Baul Samaj Unnayan Sangstha (PBSUS) is a cultural nonprofit organisation who participates in various social development issues. It relates the Folk artist/Baul artists in different social and economic activities through organising musical programs highlighting various social issues. The three fifth of population Bangladesh lives in the rural areas where people are very fond of folk and mystical music. 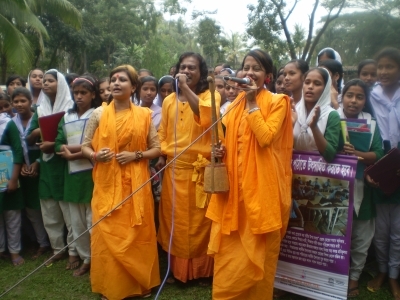 It’s very easy to reach them through the folk & Baul song for awareness rising. Bangladesh’s traditional folk musics like baul, batiali, bawaiya, lalon geeti, among others not only represent their rich cultural heritages, but they also speak the lives and livelihoods, traditions, cultures, love and affection, faith, rituals, and customs of this great civilisation. People here are traditionally very open minded and cultured. For centuries, people of this land affectionately nurtured and developed such musics, which have become integral parts of their lives. They often become refuge for the hard working, poverty-striken and disaster-affected people of this country. Among all the regions of the country, its haor belt (haor is a wetland ecosystem in the North-eastern part of Bangladesh which physically is a bowl or saucer-shaped shallow depression, also known as a back swamp. The haor basin is an internationally important wetland ecosystem, which is situated in Sunamganj, Habiganj and Moulvibazar, Sylhet, Kishoreganj, Netrokona and Brahmanbaria districts of Bangladesh) is particularly famous for its folk cultural heritages. Numerous sufi-saints and bauls since generations have enriched the tradition of folk songs of the haor region. Unfortunately, with the wave of dominant so called modern songs and cultural imperialism in the country, its rich folk songs are getting marginalised. 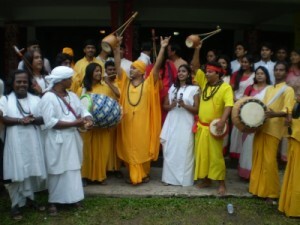 UNESCO in 2005 has enshrined Bangladesh’s ‘Baul songs’ in its Representative List of the Intangible Cultural Heritage of Humanity. A newer window of opportunities has been created through this declaration. 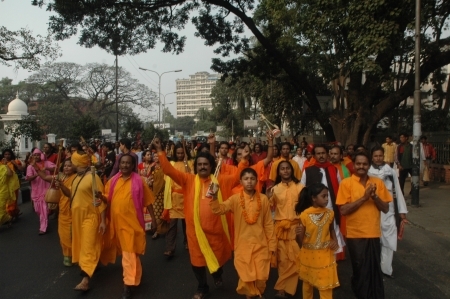 A few initiatives, mostly in personal capacities and because of large number of TV channels bauls are getting some importance, although such initiative are mostly ritualistic in nature. 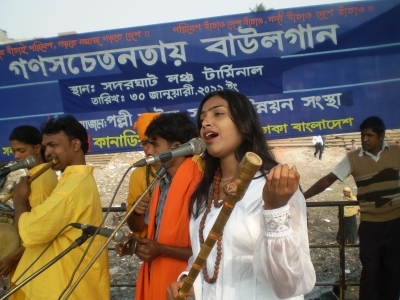 The immediate expected aims of the project are to collect numerous baul songs which are never collected and preserved from the haor belt of the country; publish the collected songs for wider audience; enlist important baul singers and train them on the need for preserving this rich tradition; and make baul songs more popular among the youths and communities through stage performance. It is anticipated that through the intervention mentioned in this project description, the Bangladesh haor folk culture will be vibrant and will brand Bangladeshi culture in outer world.